kt literary » Blog Archive » Happy Book Birthday to debut author Spencer Ellsworth! Happy Book Birthday to debut author Spencer Ellsworth! Please help us congratulate Spencer Ellsworth on today’s release of A RED PEACE – his debut science fiction novel and the first in an epic space opera trilogy! Congratulations Spencer and happy reading to all! 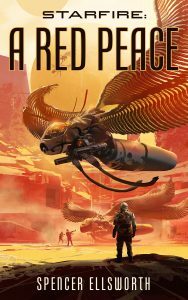 Audible’s audiobook of A RED PEACE releases today too and is narrated by the brilliant Mary Robinette Kowal and John Keating. Half-breed human star navigator Jaqi, working the edges of human-settled space on contract to whoever will hire her, stumbles into possession of an artifact that the leader of the Rebellion wants desperately enough to send his personal guard after. An interstellar empire and the fate of the remnant of humanity hang in the balance. Spencer Ellsworth has written a classic space opera, with space battles between giant bugs, sun-size spiders, planets of cyborgs, and a heroine with enough grit to bring down the galaxy’s newest warlord. ← Congratulations to Margaret Rogerson and Stephanie Perkins!